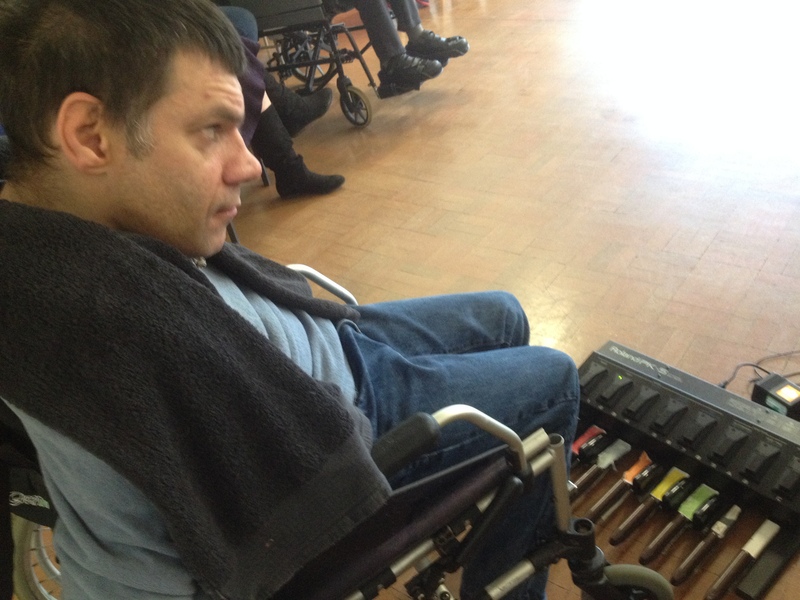 "At the fore-front of disability music." Monday saw the Musical Arc team brought together for the first Mango Tree rehearsal after a long summer break. After warm greetings and a catch up of summer news, plus a biscuit or five, the members got down to doing what they do best. The team are putting together new material which could be included in the set of five upcoming workshops around the Leeds area. The tantalising sounds of the rehearsal crept all the way down the corridors, through to the back office. We are all excited to see the new ideas being put into action after a very successful first rehearsal. Getting back into the swing of things, first Musical Arc rehearsal of the year. 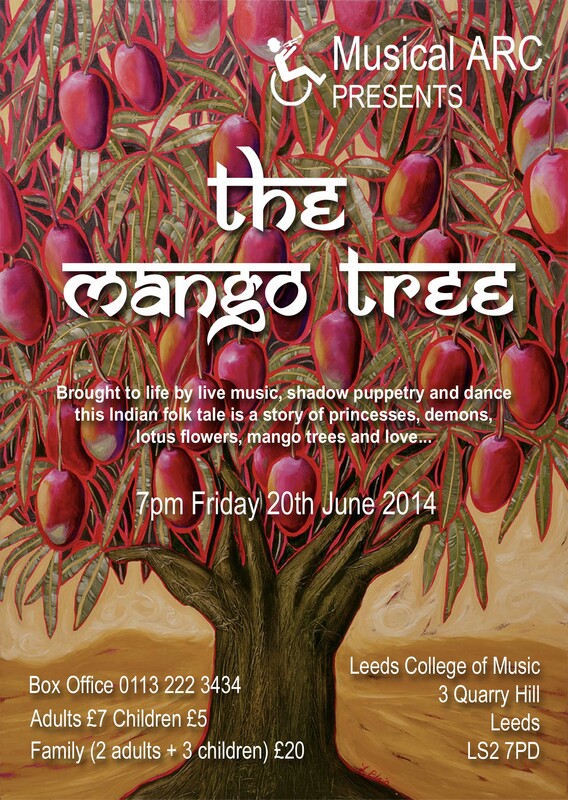 Thank You to everyone who attended the recent performance of The Mango Tree performed at Leeds College of Music on Friday 20th June 2014. The Demon closes in on Princess Jyoti. The feedback from the event was tremendous. Princess Jyoti sinking in the water. Princess Jyoti and Raj Kumar. We are planning on taking this production on tour in the future. Raj Kumar picking the flower from the water. Watch this space for future details. 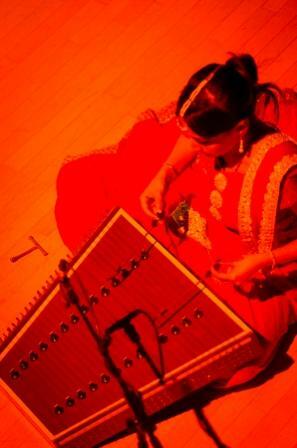 Dilrani Kaur accompanying the soundtrack on her Santoor. Subscribe to our Twitter account or join us on facebook. The Players – Musical ARC. It’s been pretty much a week since the mango-fest, and it’s safe to say I’ve made a radical transition from that person you heard about in Leeds who spoke far too much, far too quickly. Days have passed since the summit of nine months lived in hues of mellow Indian sands, and that person has been rendered utterly speechless. But now she will try and lift her head from the asphyxiating shadows of an auditorium to speak. Trying to source the true ingredient for this blog entry has been tough. I didn’t want cardamom, nor did I want comedy gold. I had already mentally trawled many a street-food market stall in my mind, but no intoxicating blend awaited my hands at the keyboard. I didn’t want sympathy either – as I turn my heel away from the M62 and leave this city – nor did I didn’t want applause (though it was certainly fun to be awash with that in The Venue on Friday!). Most of all, I realised I craved a moment from the reader. A moment of peace and quiet with me, to appreciate the sheer effort, dedication and soul of Musical ARC’s Creative Director, Lorraine Cowburn. For months, Lorraine has been cunningly crafting a masterpiece in The Mango Tree, not pausing for longer than necessary to explain to the world around her why she was stitching its threads a certain way. A little less conversation and a little more action is, without a doubt, the approach that brought such an astounding result for the audience (inclusive of every member of Musical ARC and the show team). The show was a moving, shifting experience of great beauty. But year upon year (show or not! ), the presence of the individual behind it is what makes the togetherness of Musical ARC possible. Not only possible, but awesome. In the aftermath of The Mango Tree, I had stood nibbling a bite-size barfi chunk in the foyer, and knew that from that point onwards I would let the bindi do the talking. My lip was wobbling and I could not chew. I was frozen, despite a heavy grey heat that slumped against the skyscraper windows and traffic outside. I may not have looked okay, but in fact, I was just stupidly proud of the show I had just seen, and was trying not to cry a bit (a lot) as “unique”, “magical”, “amazing”, “when’s-your-next-show? Whaddya-mean-you’re-only-doing-one-show-this-year? !”, “can-I-have-a-bindi?” and “wow” circled my eardrums like buzzing bees. I will take this moment to express all thanks and appreciation on behalf of Musical ARC, to all audience members and collaborators who joined us on 20th June for the rapture of the mango season’s finale. This included pupils and teachers of St Philips Primary, who really had meant it when they said they’d come along when we visited them for an Equal Sound workshop last month! Lastly, thanks to you reader, as you’ve heard me repeat the M word like a broken record since September. Though talking of mangoes, news is definitely on the horizon for a following chapter… This is not the end! The Mango Tree – Click on the image to see full sized version. See you on Friday 20th June 7pm at the Leeds College of Music, Quarry Hill, Leeds, LS2 7PD. You can purchase tickets from the Leeds College of Music box office (0113 222 3434). 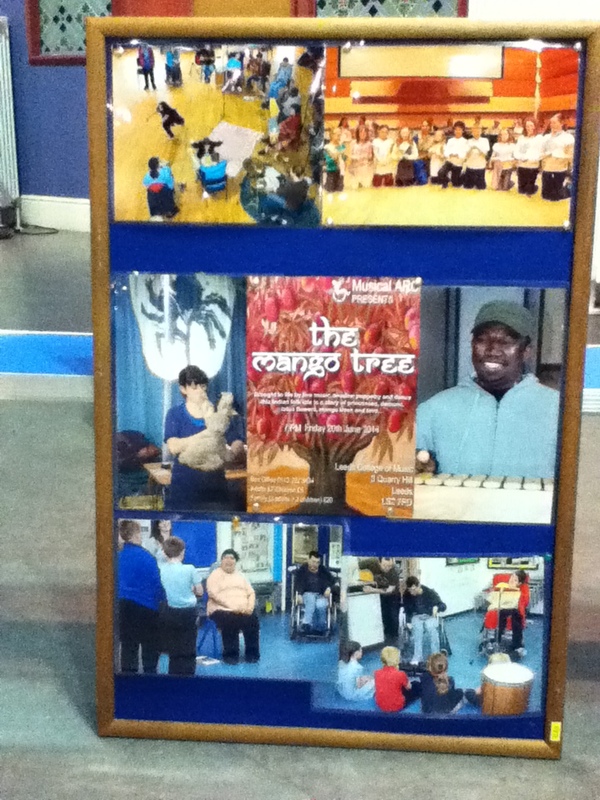 Musical ARC are performing a rendition of a classical Indian folk tale, The Mango Tree. The Mango Tree – Click on the image to see the full size version. The performance will be signed. With “The Mango Tree” a mere few days away now, I gather it’d be rude of me not to post. But truth be told, we are all getting a little nervous, excited and quiet now. Since our “The Mango Grove” workshop (delivered on Monday) is now a thing of the past, allow me to step back and reflect. Though perhaps this would all feel a little easier if my muggy little office in Meanwood had some ambiance in the form of incense, candles and live Tanpura (for those who don’t know, that’s the Indian musical instrument responsible for the foundations of captivating drones). Last Monday at the workshop, we saw a session with a difference. Primary school pupils from Carr Manor scurried round the corner, seemingly stepping from the ordinary right into the extraordinary, as their senses were magically filled with the colourful ways of India. Flashes of magenta, gold, purple and orange entered eyeshot as Dilrani (head-to-toe in full Indian goddess costume) bent down to honour each young forehead with a bindi. Sugary rainbow rows of barfi sailed across silver platters; where one-by-one they were snatched up by playful fingertips and enjoyed for the first time by Yorkshire’s children. Bells knocked together with elegant drama as Dilrani danced through angular forms; shadows told charming stories before a screen shielding Reb Caputo’s bespoke office. 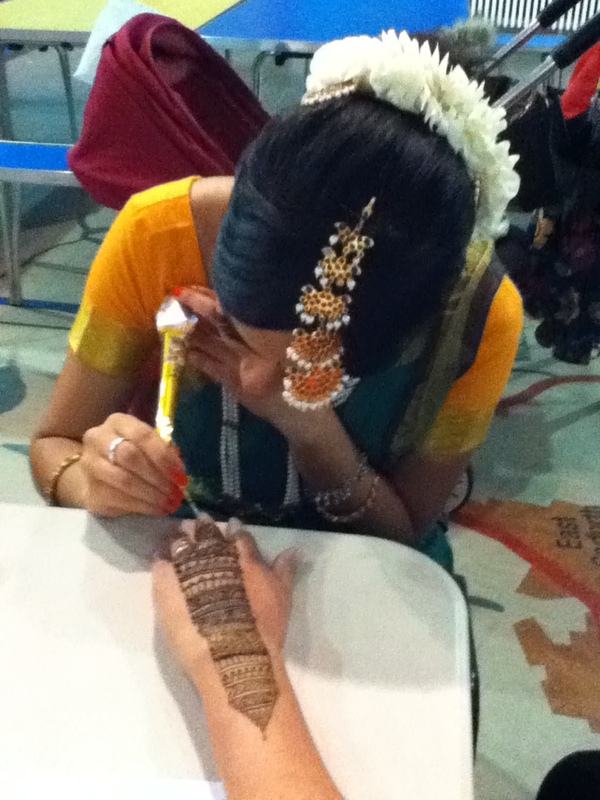 Dilrani Kaur applying henna to a hand. June 2014. Dilrani Kaur applying henna to a child. June 2014. …See you at The Venue, this Friday, 7pm. Various pictures highlighting Musical ARC June 2014. The Mango Tree is the fantasy tale of an Indian king who loses his beloved princess to a demon and yearns for her return. As a result of a grant award by the Arts Council, Musical ARC, a charity for disabled musicians, has put together a production that combines a mix of musical and visual performances in an innovative way. The story is narrated by artistic director, Lorraine Cowburn and is accompanied with music performed by Musical ARC members. 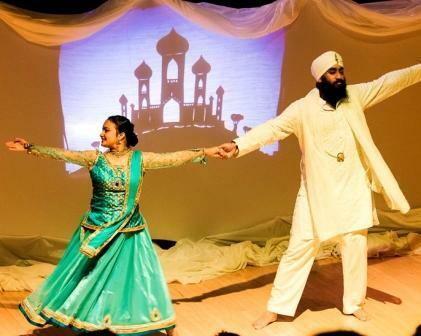 On stage is a large shadow screen on which puppets and live contemporary and traditional Kathak Indian dances are played out. 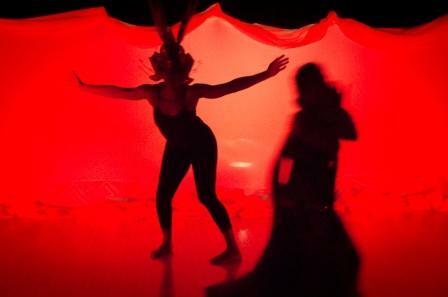 The production will merge shadow and dance; dancers will become shadow puppets, puppets will become dancers in a seamless fusion between what is in front and behind the screens. The shadow puppetry is devised by Rebekah Caputo. Contemporary dance is arranged by Amy Manancourt. Traditional Kathak Indian dance is by Jyoti Manral. The performance will be on Friday 20th June 2014 at the Leeds College of Music, Quarry Hill, Leeds, LS2 7PD. Don’t forget to check out our facebook page and twitter feed. 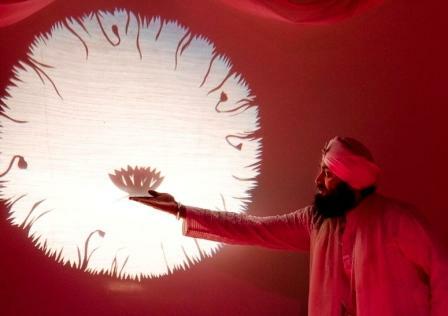 The Mango Tree performance is part of the 2014 Yorkshire Festival. My eyelids peered at the light for a millisecond, and closed again as rapidly as a sea urchin recoiling from the water’s surface. It was Monday morning, and I was unsure whether I could face the day. I was uncertain of whether I could bound two steps at a time into regularity, arms flailing between my alarm clock’s mute switch and the cheerio cupboard in my kitchen. But then – It happened. Looking up at my calendar, I realised it was June! I bolted out the door, my motions now more akin to those of a motorcycle. I ran through Headingley’s North Lane, past shop windows, past the faint essence of fresh mangoes in the green grocer’s; my head was truly spinning with the colours of India. I hailed a driver, and guided my good friend Shehnaaz into the vehicle so I could saturate her mind with the sudden intense adrenaline I was experiencing after turning a leaf in my calendar. On our way to Meanwood, we talked of the hours that would follow, of playing our latest creation like it was 1964. This was the tune ‘Indigo’, by the way, a composition that we will be sharing with you on our exclusive tour de Mango. We will also be performing this in just under a week during a community workshop held at our base in Meanwood, complete with barfi, bindis and B-Sides. 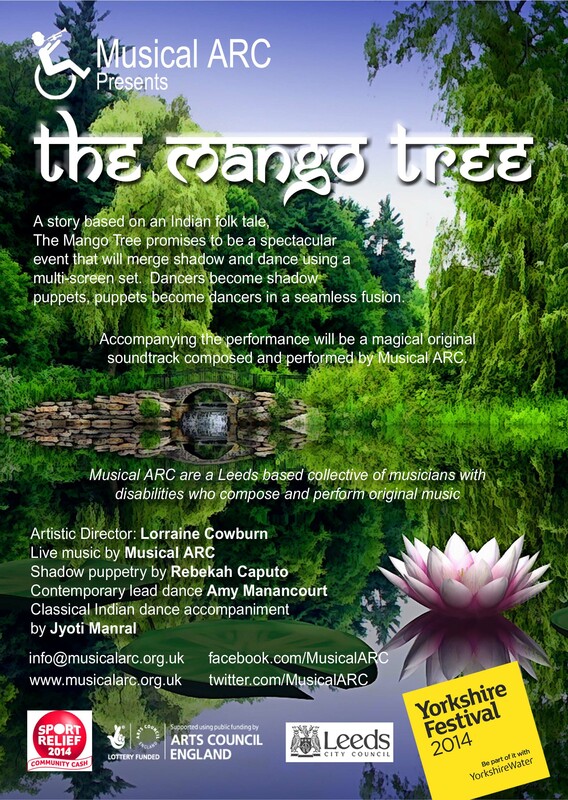 The Mango Tree’s collaborating artists will join Musical Arc in a mass inspiration aimed at the members of our community, where we will work with Music, Dance, Origami and Henna. We can’t wait. As for those walking past Leeds City Museum on Saturday… walk in, I dare you. I shall be inflated with excitement and samosas and telling the whole world about The Mango Tree show, which kicks off in just two weeks now. Book now, reserve a lassi! 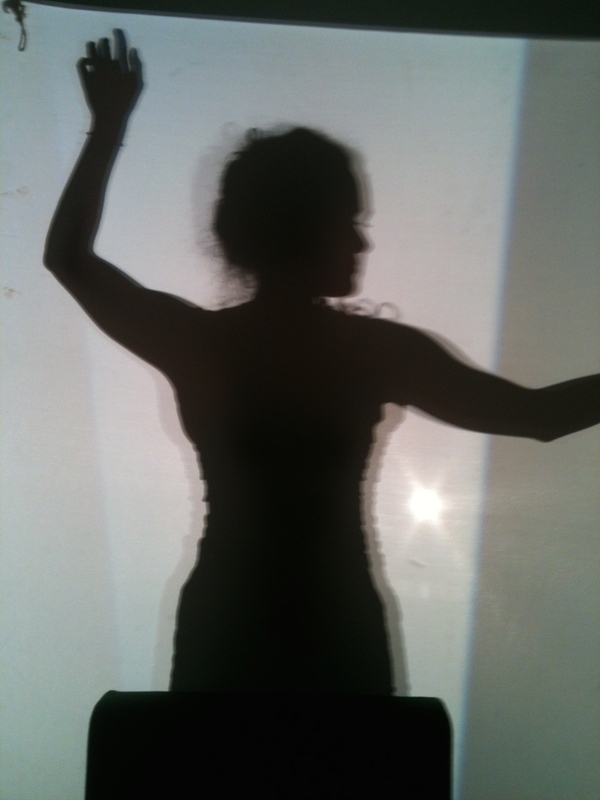 Amy Manancourt dancing behind a shadow screen in rehearsal for The Mango Tree. February 2014.